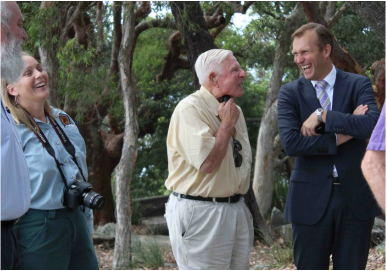 On Monday 24 November 2014, Rob Stokes, MP, Member for Pittwater, Minister for Heritage, Minister for the Environment and Minister for the Central Coast, unveiled new interpretive signs at West Head which have a QR readers incorporated. Rob Stokes highlighted the work of the West Head Awareness Team (WHAT) which includes three 4HR members. One downside of the occasion was that Jack (Bluey) Mercer, the 91 yo member of the team was not in attendance as he had fallen a few days earlier and broken his hip. Bluey had been part of the team that installed the guns in 1941/42 and has been an invaluable member of WHAT. A lot of the artwork on the signs is based on that produced by 4HR over the past 18 months, including the drawings of the long gone inclined railway. The NSW National Parks & Wildlife Service acquired the rights to use 4HR's artwork a few months ago. 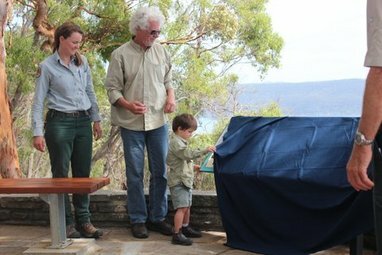 The unveiling took place with the assistance of Lachlan, about the littlest National Parks & Wildlife person we have met. Working with the NSW National Parks & Wildlife Service, particularly Natasha (in picture) and Kath, has been a great pleasure for 4HR. With the absence of key team member Bluey Mercer, Vic Rae from NSW Royal Artillery Soc. substituted. 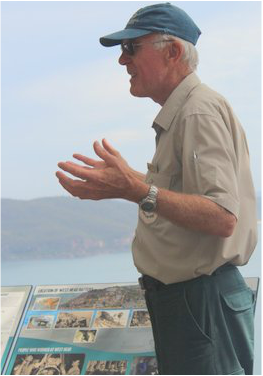 Vic is also a member of WHAT and his input to uncovering the old forts secrets has been invaluable. 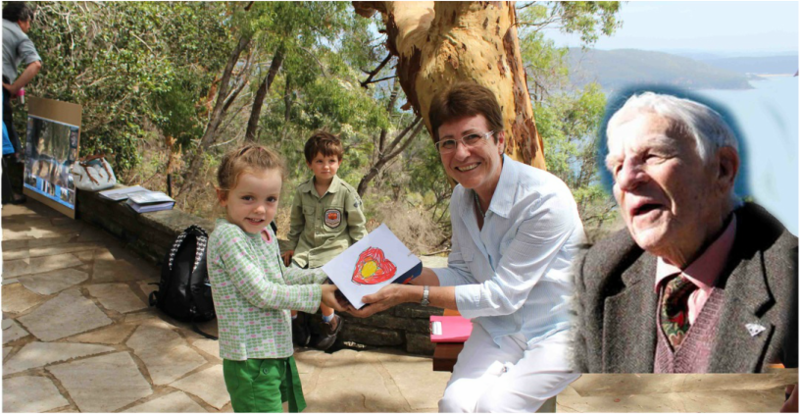 Lorraine Mercer received a hand-made get-well card for Bluey from a couple of NP&WS volunteers, Charlize and Lachlan ('about the size of the little end of nothing sharpened', quote: Foghorn Leghorn). We all look forward to seeing Lorraine and Bluey at West Head in January 2015 for his 92nd birthday. steep old soldiers track leading down to the fort. Undertaking the necessary work to make the track safe and fill in the gaps will allow the public (albeit relatively fit ones) access to this historic site for the first time in almost 75 years. 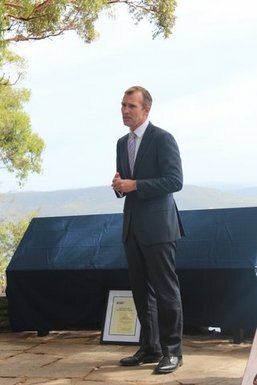 Rob Stokes announcement that the government would undertake the necessary work, including a set of stainless steel steps, delighted WHAT, particularly Rohan. The work is expected to be completed by the end of 2015 and will bring new life to the old fort and an opportunity for a new experience for visitors to Ku-ring-gai National Park. The new signs encapsulates two years of work, the unveiling day was enjoyed by all (in the pic, right, particually Rob Stokes and author of a number of historical books and member of WHAT, Jim Macken). 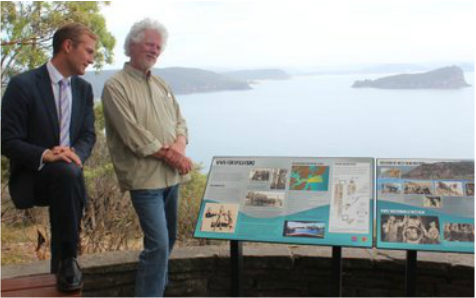 Bay, Pittwater and the entrance to Gosford's extensive network of inlets and bays, now have an additional element. The thousands of visitors can now learn of the historic fort hidden from view below them. Peter from 4HR had the opportunity to talk to a very interested Rob Stokes about building working models of the railway and the site. These models will have many applications, they can be filmed to be used on QR readers for example and would be the central part of a traveling exhibition, which would be displayed in public areas and schools on both sides of the Hawkesbury River. In schools the exhibition would not only bring history to life but also demonstrate practical physics with its 2:1 weight and counter-weight operating principle. (It was announced in February, 2015 that the NSW Government will assist 4HR in producing the working models. With a completion date of early June, these will remain a valuable asset for NPWS available to 4HR and W.H.A.T) see more under 'The Inclined Railway' heading on our WEST HEAD BATTERY page.